Some work hardly seems like work at all. I’ve been working with Chocomap.com for a few years now and last fall we started developing a mobile strategy. Chocomap.com helps people find fine chocolate shops around the world, and displays them on a Google map. There are almost 2,000 shops in its database (and growing all the time) and putting that information on a smart-phone makes perfect sense. We launched the iPhone version, Find Chocolate!, at the app store just before Christmas. Shortly afterwards, we started work on an Android version, which was released mid-March on the Android Market. Find Chocolate! 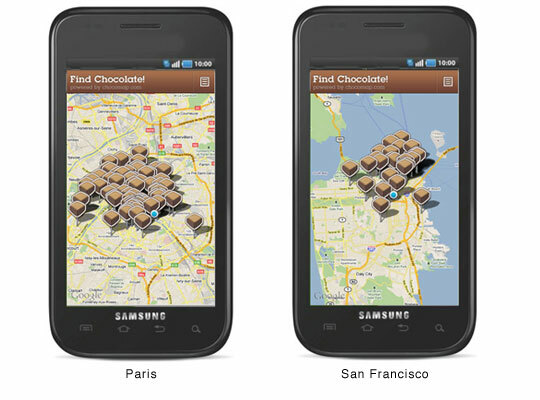 on Android or iPhone both use the phone’s location awareness to hone in on chocolate shops near where you are. Within seconds of launching the app, you get a list of shops nearest you, in order of closest to furthest. You can also get the same ‘list’ on a map. Tap a listing and you get store details and directions. 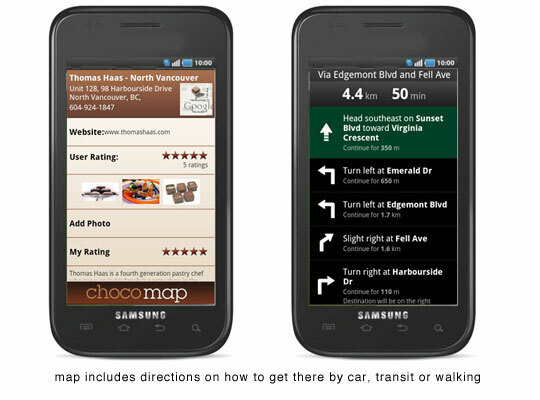 The apps share the Chocomap.com database, so shop listings are synced on all platforms. And both apps allow you to add a shop right from your phone, as well as upload pictures and rate shops you’ve visited. For the iPhone app, we worked with Vancouver’s Mod7 Communications. 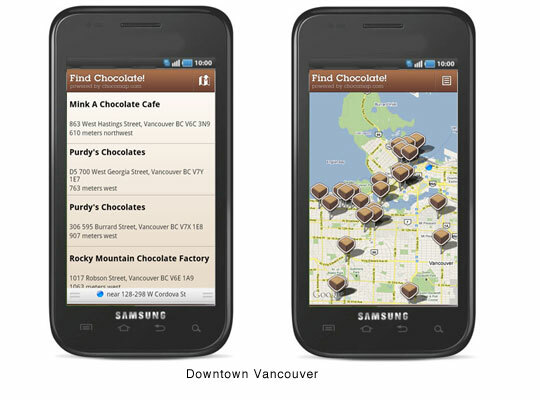 Android development was by Vancouver’s Ikamobile who specialize in apps for Android devices. Like the web, apps really are global in reach. To date, the Find Chocolate! app has been downloaded in 27 countries.